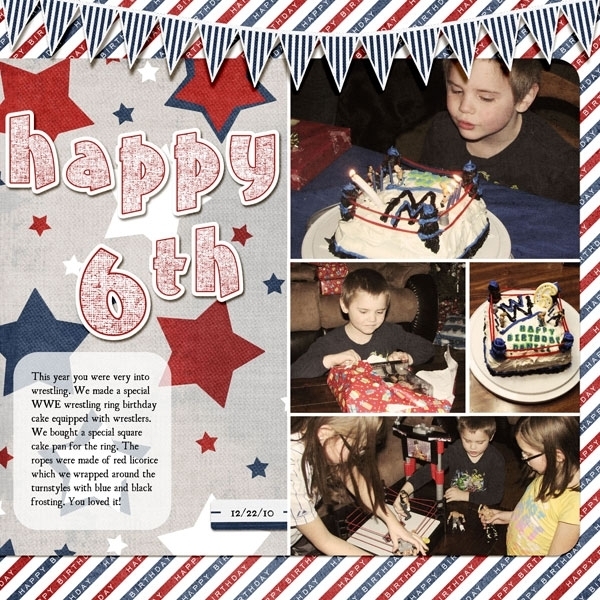 Photo Information for Happy 6th! Ahhh. Cute layout! I like your photos and the flags across the top. I also really like how the title almost pops off the page! Love the colors, stars and stripes. Great photos. Cute, cute, cute, Jen! I love your dimensional title! He's a sweetie - love the wrestling theme - aren't little boys wonderful? Nice! I like the cheery red white & blue. The flags across the top look great - I'm not sure how you got them to pop to high - and I see the shadows aren't all on the same side of the flags - amazing!